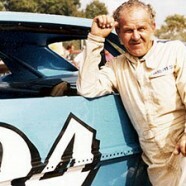 On December 1, 1963, Wendell Scott became the first Black driver to win a race on NASCAR’s highest level, the Grand National Series. He finished the race at Speedway Park in Jacksonville, Florida two laps ahead of the the second place finisher Buck Baker, however Scott was not announced as the winner, with Baker getting that honor instead. After Scott protested the finish, NASCAR claimed that a scoring error was to blame and awarded him the victory. Many in attendance believe that NASCAR was terrified of the prospect of Scott kissing the white beauty queen, a NASCAR custom for the race winner. In 2010, the Jacksonville Stock Car Racing Hall of Fame presented Scott’s family with a trophy, as Baker had taken the original trophy home with him 47 years earlier.